Shimaoka Tatsuzo (1919-2007) was the leading disciple and student of Hamada Shoji (1894-1978), whom he succeeded as the pre-eminent potter of Mashiko, the ceramic-producing town northeast of Tokyo which Hamada made his home in 1924 on his return from having helped Bernard Leach (1887-1979) establish the Leach Pottery in St Ives, Cornwall. Shimaoka, like Hamada before him, was well known outside Japan as well as within, and in 1996 was appointed a Living National Treasure by the Japanese government. The hallmark of Shimaoka's work was his use of rope-impressed patterning. 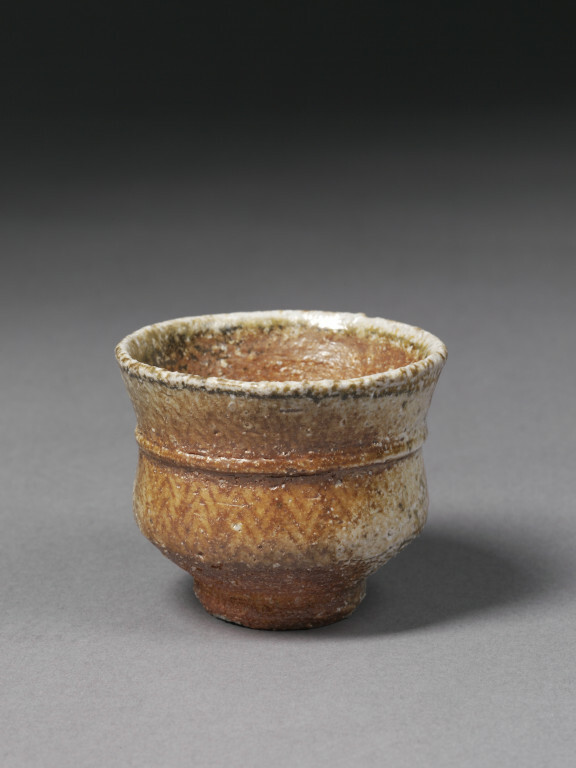 While this was partly a result of his father having been a rope-maker, it was more to do with the fact that the area of Japan in which Mashiko is situated is home to numerous prehistoric sites once occupied by the Jomon (lit. 'cord pattern') people, whose name is derived from the rich variety of earthenwares decorated with rope-impressed patterns that was a key characteristic of their culture. Given by the maker through Keramik Vertrieb Gmbh, Alsterdorfer Str. 300, 2000 HAMBURG 60. 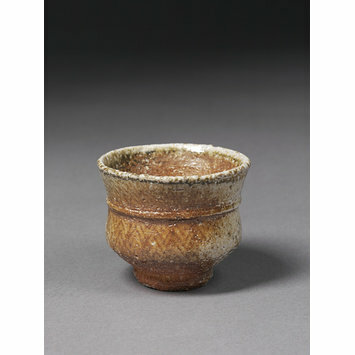 Cup for sake, stoneware, made by Shimaoka Tatsuzo in Mashiko, Japan, ca. 1977.